We have no idea when the first houses were built in Danehill. The road through the village originated as an iron age trading track, c.500 BC, connecting the North Downs at Titsey Park with the South Downs at Westmeston. 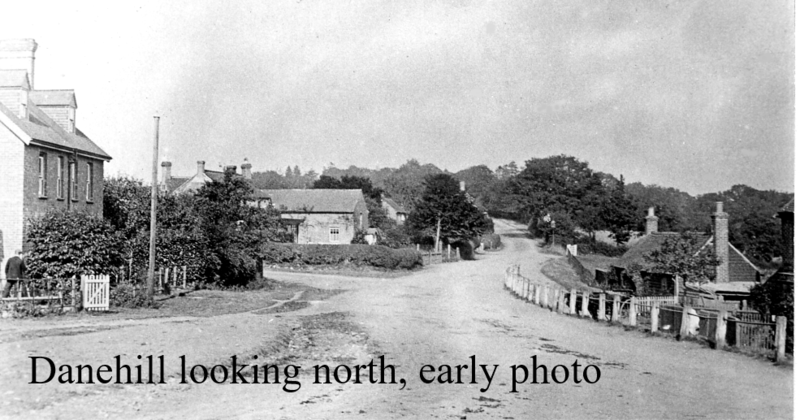 Like the present road, the track followed the narrow ridge down from Wych Cross to Danehill, but then ran along what is now Freshfield Lane. The road to Lewes, which is probably Saxon in origin, went over Church Hill, until a by-pass was made round the east side of the hill in 1818. The earliest surviving houses are the Forge and the back part of The White House; the style of their timber framing indicating a date of c.1450. They were built either side of a green, across which ran the London to Lewes road where it was joined by roads from Freshfield, Horsted Keynes and Chelwood Common. The main road formed the boundary between the ancient parishes of Fletching and Horsted Keynes, out of which Danehill Parish was created in the 19th century. It was also the boundary at this point between the Manors of Sheffield and Horsted Broadhurst. The closing years of the 15th century saw the introduction of the blast furnaces into Sussex with their ability to produce iron in commercial quantities. It brought wealth and employment to the area which, up to then, had been poor and backward. 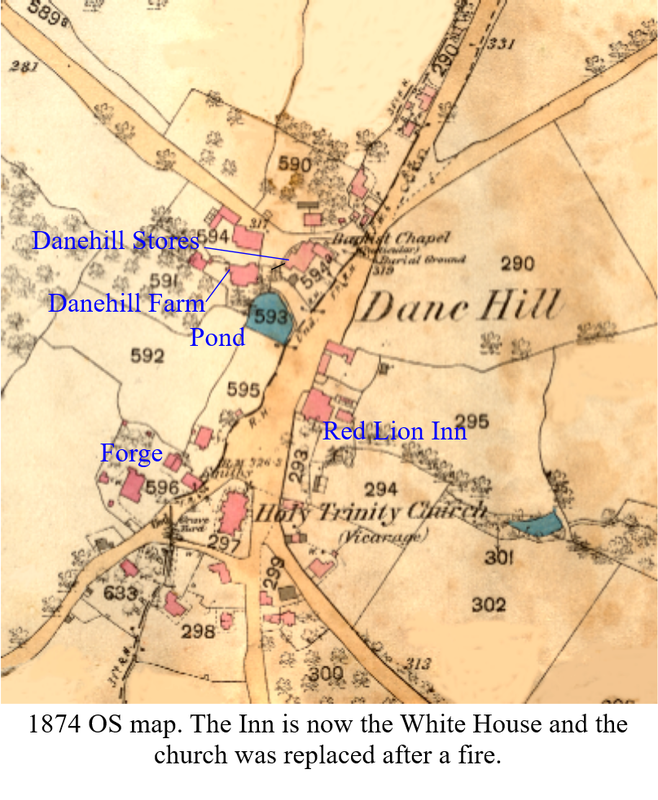 Danehill appears to have prospered from these activities and by the early 1600s we know of three other houses round the green, as well as a barn. Danehill Farm barn (6), was also probably in existence by then Unfortunately all these buildings have either been demolished or rebuilt. The White House had probably become an Inn, the Red Lion, where pack horse trains operating between London and Lewes would stop to put down and pick up goods. By 1637 there was a smithy where Danehill Stores now stands. From then on, until the end of the 18th century, a number of small enclosures were granted from the green on which cottages were erected, including, which started as a weavers shop in 1790 and had been converted to a cottage by 1830. Freshfield Lane. At this time it was the main road from London to Brighton, which went via Lewes until a shorter road was built through Cuckfield in 1761. This would have affected the trade at the Red Lion, which was further hit when the Sheffield Arms was built at Sheffield Park in 1777 as a coaching inn. The Red Lion stopped trading c.l820. More cottages were built during the 19th century and, when Holy Trinity Chapel was erected in 1835, the last vestiges of the green disappeared. Because of the constrictions of the site the chapel was orientated north south, There were two galleries, the west one for the Danehurst estate built up by Francis Davies, and the east one for the Woodgate estate owned by his brother Warburton Davies. In the 1870's H.C..Hardy took over Danehurst and C.J. Corbett took over Woodgate, now Cumnor House School. Both families were to play an important part in Danehill affairs. 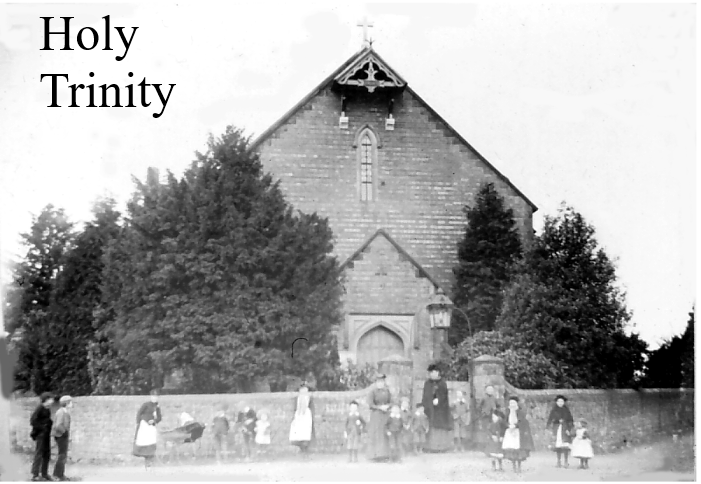 There was also a Strict Baptist Chapel in the village, built in 1823 alongside the cottage which had replaced the smithy cottage about 1790: the smithy having been moved to a site in Freshfield Lane , moving to in the 1880's. The cottage became the minister's home and, to provide an income, he established a shop there. (See separate article on the chapel). Another commercial enterprise was the beer house established before 1847 in cottage (2), dating from 1701. It became known as the Crocodile, was rebuilt in 1907 and converted into three private houses in 1987, with two more built in the garden. In 1892 All Saints Church was erected on the hill above the village by Mrs Hardy as a memorial to her husband H.C.Hardy. The old chapel and Nos 17, 19 & 20 were then demolished to create a view of the new building. In 1920 a War Memorial was put up where the chapel had stood and, in 1961, the site was transferred from the Church to the Parish Council: it is now designated as a village green. A Working Men’s Club and Reading Room was built by Mr H. C. Hardy in 1886. In the 1930's it became the British Legion Club and, in the early 1950's, was extended and the village pond filled in to make a car park. In recent years it has become the Danehill Social Club. During the 1880's Little Danewood East and West were erected in Church Lane, Rose Cottages with the Bakery on the Lewes Road and East View Cottages on the London Road. Other developments since then have been the rebuilding in 1905 of Victoria House, the shop added to Rose Cottages in 1922, Danehill Memorial Hall in 1923, St Crispins c.1926, the new vicarage in 1988 and an extension to No 3 with a new cottage behind. Whilst there has been little change to the centre of the village in modern times, there has been considerable development on the outskirts, on the A275 north of (33), along Freshfield Lane and Oak Tree Cottages to the east.The area from the old Baptist Chapel southwards forms part of the Danehill Conservation Area.